We offer quality repair and competitive prices for all of your exhaust system and muffler repair needs. Make sure to stop by our 861 Lila Ave location for an inspection, as a damaged exhaust can hurt both your car and the environment. 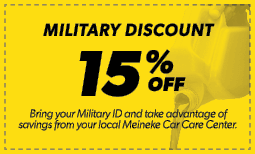 When you need brake repair, brake pad replacement, or even a total brake job, our local Milford, OH Meineke is there to help you with everything you need to drive (and stop) safely. The staff was very friendly professional and knowledgeable. Jim Olson is a caring and hard working manager who puts the customer first. I wasn't a number. I was a name with a genuine concern for my family and he understood that. He took car of me while Dale took excellent care of my vehicle. I'm going to recommend this location to everyone and return with all my automotive needs. Thank you so much! We won't forget you. Staff went above and beyond and took very good care of my truck. I am very pleased with the service.